Big changes are in store for health insurance coverage in Washington. Because of the Affordable Care Act (sometimes also referred to as "Obamacare"), more people are able to get preventive care, like check-ups and cancer screenings, treatment for diabetes and high blood pressure, and many other health care services they need to stay healthy. And we’re changing the name of Medicaid. We’re calling it Apple Health. You may have already heard of Apple Health for Kids. A while back we combined all our children’s health services into one program that’s streamlined and easy to remember — Apple Health for Kids. Apple Health for adults is the same idea. We will gradually combine all our adult Medicaid clients under the Apple Health umbrella. If you’re not eligible for Apple Health, you may qualify for help with your health insurance or for other health services. The website will help you with that. Don't be fooled by scams! See tips on safely applying for Apple Health. 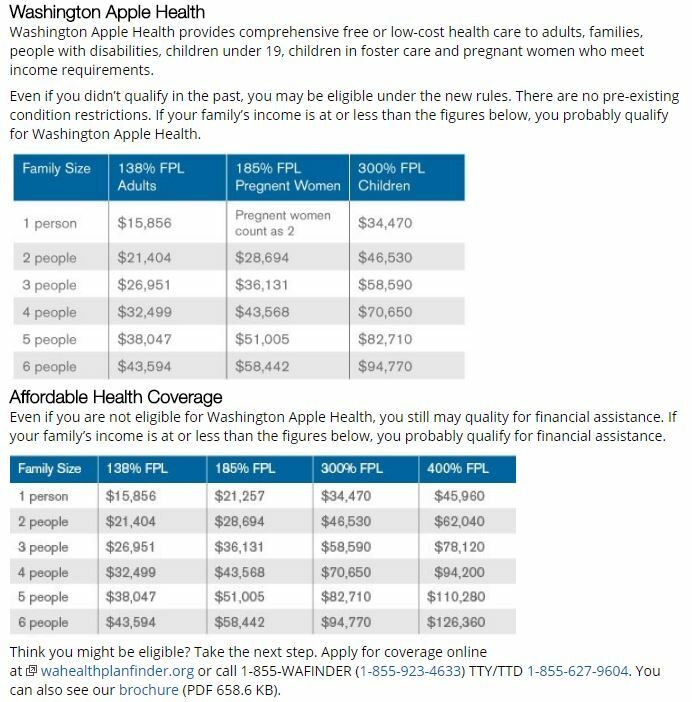 Most Washington Apple Health (Medicaid)-eligible individuals receive their coverage through a managed care plan. If you're currently enrolled in an Apple Health managed care plan, you can switch to a different plan at any time. Your plan change will begin on the first day of the next month. The Health Care Authority offers five health plans that provide services to our Washington Apple Health clients. ​All health plans offer the same basic services. Medical coverage for children living in Washington State. Each program has its own eligibility guidelines. There are no resource limitations for the Apple Health for Kids program. Additional information about the State Children's Health Insurance Programs is available at the Apple Health for Kids website. Applying for Apple Health for Kids: You can apply at your local community services office or online using our Online Application for Services.